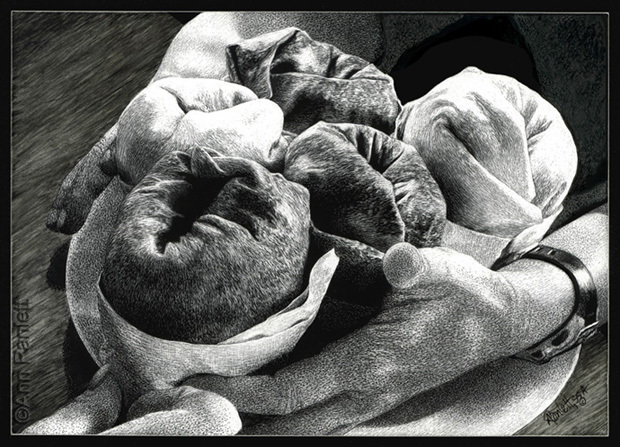 My scratchboard drawing, “Cathy’s Burrito Bouquet” is headed to the Fine Art Exhibit at the California State Fair (July 10 – 26, 2015)! I’m thrilled and honored that this is one of 180 pieces selected for the show and one of six works in the “Drawing” category. In addition to having a piece in the show, I have been asked to demonstrate scratchboard for three days during the run of the Fair. See this events page for more details about the demo days. 7.19.15 UPDATE: The drawing received an “Award of Excellence” at the fair. This entry was posted in events, shows. Bookmark the permalink.